In our days, why oh why should one still use LaTex. This you might ask and you would be completely right to pose this question. Still LaTex is in wide use in the academic field. Is it all about the beautiful math typesetting? Or about the robust integration with citation tools? Is it about the perfect typography or just about the set and forget nature of this ancient tool? As my bachelor thesis writing is coming up rapidly I was ready for some serious procrastination. Why not just try out Latex and learn something new respectively something established? As I was very concerned about the looks of my text I hunted around for a nice base to adapt for my template. After some research I found the popular and very beautiful classicthesis template from André Miede. The template looks great as it is already. But as usual, not everything was set up exactly the way I would have liked it to be or was demanded by my department. That's were tinkering started. Finding the right places to change something was not that easy though. In LaTex many things seem to be interconnected. Changes here, trigger other changes in unexpected places. But this may also just be me and my limited understanding of the LaTex architecture. At the same time, I feel that one needs far too many plugins and configuration when layouts deviate from mostly text. With this, complexity rises exponentially. In the end, I found myself configuring tables or even table cells individually. This might not have been a problem, when Tex was one of the only sensible tools to set text. But nowadays, this kind of thing is where layout software excels. It's much faster and the direct visual feedback makes it more exact. Still, LaTex keeps one of the stronger points of code based layouting: It can easily be generated. 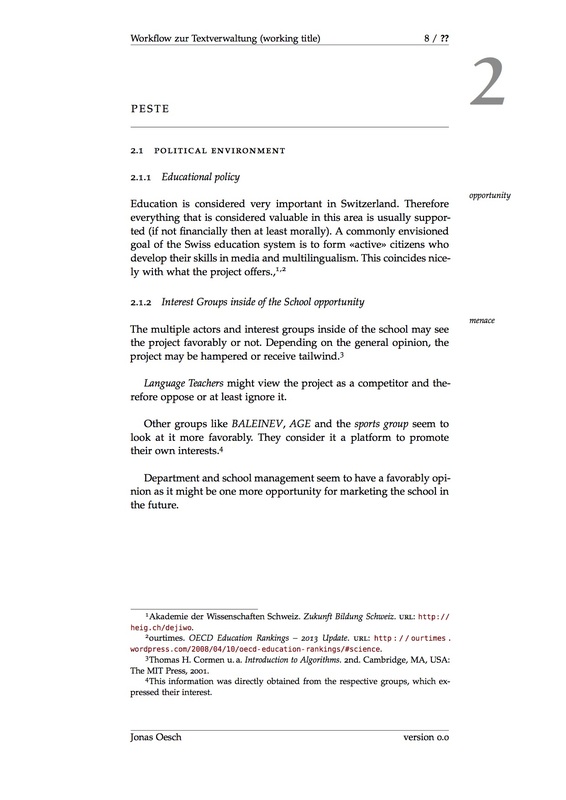 Writing parts of the thesis in my all-time favorite Markdown and seeing it produce a beautifully formatted PDF in an instant felt like magic. This is actually not that easily achievable with even the most current tools. The biggest problem is very often that text-setting is not proper. HTML/CSS only just gained the capability to hyphenate text while Tex had one of the best algorithms for hyphenation more than twenty years. On the other hand, many aspects of LaTex start to feel very dated. Support for UTF-8 for example is spotty at best. This also was the final nail in the coffin. I really wanted to love LaTex for all of its beauty. But in the end it is just too old school.